Creoqode is a group of engineers and programmers based in London dedicated to building hardware and software skills through building and doing. Their current project is Pyxa, a game console kit that lets users build a game controller and then program their own games. Pyxa is running a Kickstarter campaign to fund their first round of components. 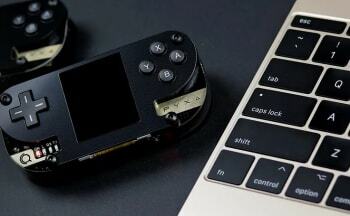 Pyxa uses an ATmega328P processing platform and a 128 x 160 pixel, 18-bit color display. The rechargeable battery can pump out four hours of continuous use with its 600 milliAmp hour capacity. A buzzer and micro SD card socket are also built into the controller, with a cross pad and four buttons arranged in the familiar Xbox / Playstation diamond configuration. Assembly instructions and video tutorials are provided to teach new users exactly how to assemble the controlller. On the software side, Pyxa is based on Arduino coding platform and compatible with Windows, Mac OS and Linux. 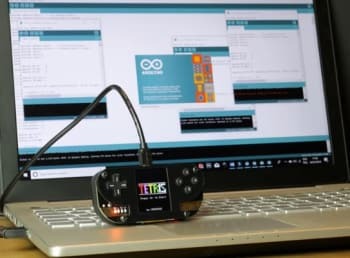 Several games are available to download - Tetris, Asteroids, Flappy Bird and a snake game are shown in the promotional materials - but Creoqode hopes that users will build their own games and distribute them to the community. 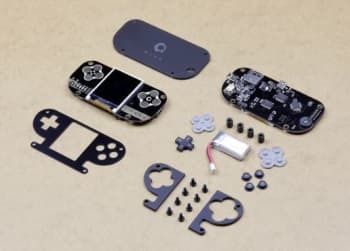 Creoqode is entering a crowded field of game controller kits but the Pyxa has a commitment to open source software and hardware and has made the rounds to Maker Faire and other trade shows in the last year. Creoqode is an already established company and I've followed their Nova AI system for a while along with the existing 2048 console. The campaign is nearing its goal with a healthy comment section of hobbyists discussing features and asking about possible add-on components. The campaign ends on March 16, 2019.